These are a good snack for a hike or a road trip.. Or you could eat them in bed while you watch The Colbert Report, either way. In a large bowl, mix together oats, coconut flakes, pretzels, walnuts, almonds, sesame seeds, and raisins. Mix together peanut butter, maple syrup, and vanilla in a small bowl, then microwave on high for 1 minute. Combine the wet and dry ingredients and add chocolate chips, if desired. Generously grease a baking 9×13 pan or sheet and pour in the mixture. Press into the pan and even out with a spoon or a rubber spatula– bars should be around 1 inch thick. Bake for 15 minutes. At around 7 minutes, rotate the pan. Let cool, refrigerate and cut into approx. 12 bars. 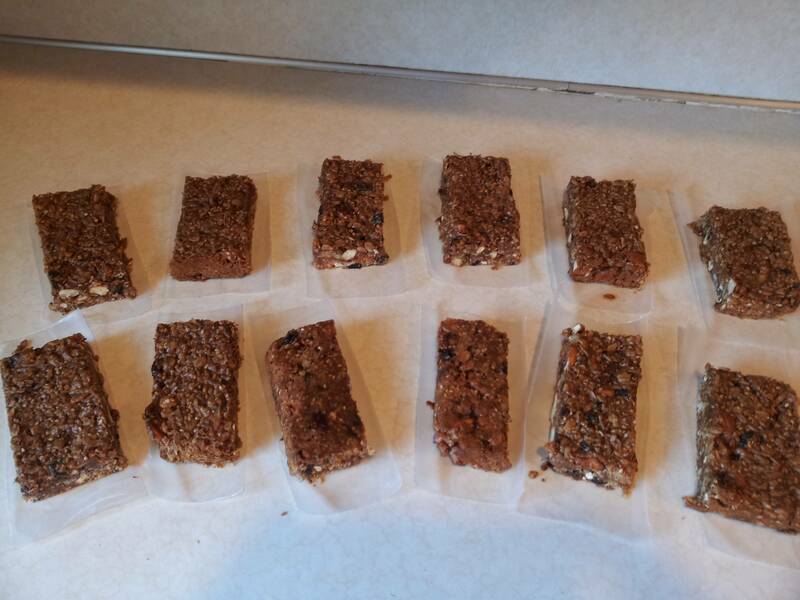 This entry was posted in Recipes and tagged almonds, chocolate, coconut, maple syrup, oats, peanutbutter, pecan bits, pretzels, raisins, sesame seeds, sunflower seeds, vanilla, walnuts.